This fiery travelling party that goes by the name of Op Sa! is big, bold and brass-heavy. Bringing their own passionate brand of Gypsy Balkan music, Op Sa! is an addictive blend of wild beats, gypsy flair and modern sound. They’ve supported top bands such as Serbian band KAL, worked alongside producers Gypsy Hill and performed at prestigious venues such as the Royal Festival Hall alongside the London Philharmonic Orchestra. 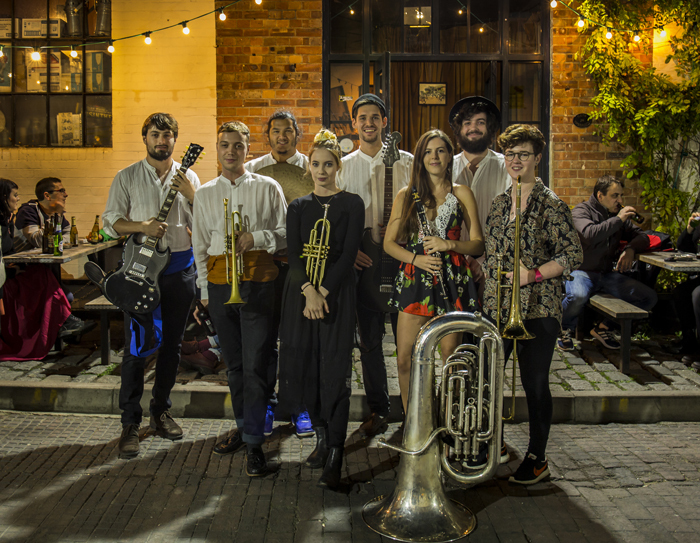 In 2017 they were featured on BBC Proms, BBC Radio 3, and their most recent two projects involved collaborating with young Romani rapper MC Azza to produce a charity single aimed at helping refugees, as well as inviting the Macedonian master trumpeter King Naat Veliov of Kocani Orkestar to a collaborative performance in London. Listeners can look forward to songs from Serbia, Macedonia, Bosnia and the Roma culture with a growing number of original compositions and arrangements incorporating jazz, rock and prog influences. The band’s sets are orchestrally varied and dynamic, and ooze passion for what they do. The original band teams up a trumpet section with clarinet, sax, trombones, tuba, electric guitars, and drum kit, giving a contemporary twist to deep-rooted cultural influences and create an unmistakeably rich sound. Lately they’ve been featuring their small band comprised of lead guitar, rhythm guitar, trumpet and tuba and playing some more mellow selections. You will be mesmerised, compelled to dance and unable to drag yourself away from this lively gypsy party.